LIC New Children Money Back Plan is a participating non-linked Regular Premium Money Back Insurance plan. Life Insurance Corporation of India has Specially Designed this Plan to meet the Educational, Marriage and Other Needs of the Growing Children through Survival Benefits. 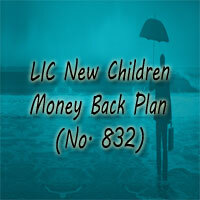 LIC New Children’s Money Back Policy (Plan No. 832) was introduced on 04th March 2015 with a Unique Identification Number (UIN) of 512N296V01. In addition to the risk cover on the life of the child during the policy term, it also provides Survival Benefits on Specified Durations to the Policyholder. LIC New Children Money Back Plan can be purchased by any of the parent or grandparents for a child aged 0 to 12 years. On the death of Life Assured before the date of commencement of Risk: The Total Amount of Premiums Paid excluding Taxes, Extra Premium, and Rider Premium if any shall be Payable. On Death after Commencement of Date of Risk: The Death Benefit can be defined as the Sum of “Sum Assured on Death” and Vested Simple Reversionary Bonuses and Final Additional Bonus, if any, shall be payable. This death benefit shall not be less than 105% of the total premiums paid as on date of death. Survival Benefit: On Surviving Life Assured will get the Survival Benefits of 20% of the Basic Sum Assured on completion of ages 18 years, 20 years, and 22 years. Maturity Benefit: If the Lif Assured is Survived until the Stipulated Date of Maturity, 40% of the Basic Sum Assured along with the vested Simple Reversionary Bonuses and Final Additional Bonus (FAB) shall be payable as Maturity Benefit. Option to Defer the Survival Benefit: The policyholder will have the option to take the survival benefit at any time on or after its due date but during the currency of the policy. The Policyholder should intimate about this Six Months before the Due Date of the Survival Benefit in writing. LIC Children Money Back Plan is a Regular Premium Money Back Insurance plan. It Provides Risk Cover to the Life of the Child during Policy Term. It also provides Survival Benefits on Specified Durations along with Risk Cover. The Parents or Grandparents of a Child Aged Between 0 to 12 years is applicable to take this LIC New Children Money Back Policy. You have the option to take the Survival Benefit at any time on or after its due date but during the currency of the policy. By Paying the Additional Premium an optional rider namely “LIC’s Premium Waiver Benefit Rider” can be taken on the life of proposer aged between ages 18 to 55 years. You can calculate the Minimum Premium that has to be Paid to take the Policy By Using the LIC Children Money Back Premium Calculator. The Amount of Premium Paid will depend on the Sum Assured, Policy Term, Premium Payment Modes and Age of the Life Assured. You need to enter Some Basic Information like Name, Mail Id, Mobile Number, Age, Policy Term, and Minimum Sum Assured to calculate the Premium Value. Life Insurance Corporation of India is offering a Special “LIC’s Premium Waiver Benefit Rider (UIN: 512B204V01)” (Optional) under this New Children Money Back Plan (Plan No. 832). By Paying Additional Premium, Policyholder Aged Between 18 to 55 years can avail this “LIC’s Premium Waiver Benefit Rider “. People who wish to get the LIC Premium Waiver Benefit Rider should meet the below Eligibility Conditions. Premium Paying Term: Same as Basic Plan. LIC provides Rebates for the Policyholders under this Policy. Rebate means getting a discount on tabular premium as per the payment mode of the policy. The Rate of Rebates for LIC New Children Money Back Plan is given below. Rs. 1,00,000/- to Rs. 1,95,000/- NIL. Rs. 2,00,000/- to Rs. 4,95,000/- 2% of Basic Sum Assured. Rs. 5,00,000/- and above 3% of Basic Sum Assured. CEIS Rebate: An Employee of the Corporation is eligible for the Rebate on the tabular Premium under Corporate Employees Insurance Scheme (CEIS). The CEIS Rebate Rates are given below. You can Buy the LIC New Children Money Back Plan from the Nearest LIC Branch Office or through online at the LIC’s Official Website or From the LIC Agent. The Documents required for buying LIC New Children Money Back Plan no. 832 are listed below. LIC New Children Money Back Plan can be revived before two years from the date of First Unpaid Premium (FUP) and before the date of maturity. Riders: A Special ” Premium Waiver Benefit Rider” Rider is available under this Plan. The LIC Children Money back policy can be surrendered at any time during the policy term by Successful Payment of Premiums for three full years. The Guaranteed Surrender Value and Special Surrender Value shall be Payable on Surrendering the Policy. The Guaranteed Surrender Value which is the Percentage of the Total Premiums Paid excluding Total Premium Paid and Premiums for Riders, shall be payable on surrendering of the Policy. Paid-up Value: If the Policy Holder has paid Premiums for at least Three Full years and any Subsequent Premiums be not paid, the Policy will be still Valid and will be treated as Paid-up Policy. [(Number of premiums paid/Total Number of premiums payable) x (Sum Assured on Maturity plus Total Survival Benefits payable under the policy). Back-Dating Interest: The Policies can be Dated back within the Sam Financial year. The Rate of Back-dating Interest will be charged by the corporation from time to time of completion of policy. Proposal Forms: Proposal Form no. 300, 340 and 360 0 issued by U & R Department will be useful for this Plan. 3. What happens, If I Want to Surrender my LIC New Children Money Back Policy? Ans: You can avail the Guaranteed Surrender Value & Special Surrender Value on Surrendering the LIC Children Money Back Plan at any time during the Policy Period.